To date, there are more than 30 Canon cameras in circulation in the market. Eighteen of these products fall under the A-Series Digital Cameras which is more commonly known as the PowerShots. This review will focus on the Canon PowerShot A2300. Affordable price. For a compact camera that provides the point and shoot experience, users will get to enjoy the basic features they usually look for at a reasonable price. Sharp lens. We all want clarity in our photos and the Canon PowerShot A2300 gives us exactly that. One might think that such clarity in pictures usually comes at a high price but then again, Canon has made price and clarity a package through this model. Speedy. The shutter snaps as soon as you press it with no significant delays. This gives users the ability to capture rare moments in photos without the demand to smile a little longer. Built-in Help Guide. It’s a good idea to conserve paper by including a User Guide within the camera itself. Think about taking a tutorial over a certain function while looking at the camera screen. It gives the kinesthetic user a very hands-on experience. Colors. The Canon PowerShot A2300 comes in variety of colors like red, black, blue, and silver. These colors add personality to their owners. Creative modes. Well, there is always this wacky kind of preference among people and the options offered by the Canon PowerShot A2300 matches that need. With these options, one can personalize photos at will. Color reproduction. When the image is clear, it can be reproduced to a surprisingly high quality colored photo. Ease of use. With a guide built within the camera, it is not a wonder why users will find this model easy to operate. ISO Performance. Unlike the other models along its class, the Canon PowerShot A2300 has been receiving quite a feedback in terms of its ISO rating when it comes to image optimization. Image stabilization. While this product is quick on the shutter, users will expect to do a second take. For people who have shaky hands, this might prove a challenge. One can only think that a stable image can be captured when the photographer is at its moment of stillness. Video support. People would want a camera that can take pictures and shoot videos. 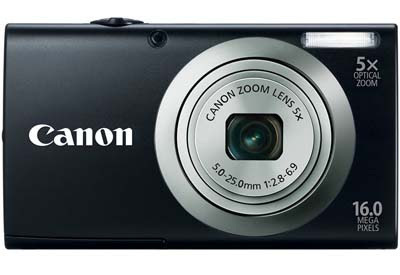 However, they might not find that a good feature in the Canon PowerShot A2300. The idea of snapping pictures is already here but when it comes to video recording, it may not be as competitive as the other models under its class. Continuous shooting. This simply means that you need to take a “break” in every picture you take. It does not support continuous shooting as other models do. In effect, it cooperates by allowing you to take a rest between takes. Image detail. This is applicable for large print photos. The details are not too fine if a photo is reproduced in a bigger size. Optical zoom. This is only observed when in video mode. So if you plan to focus on something in a vide sequence, you simply can’t because it’s not designed to do that. All products would have its ups and downs only because we cannot get everything we want in a single device. The concept of sacrificing something to accommodate another is still operational unless costs are not a problem. In this case, the Canon PowerShot A2300 is an affordable type of camera that suits those who do not take pictures all the time. With the desirable features it has to offer, one can only think that he is getting the best value for his money when compares this product to its competitors. users might have a few comments about it too. And this is the same reason why technology is being replaced from time to time. It is to introduce developments based on the perceptions and needs of the general public. Therefore, this camera is not bad at all. The basic function it has in the photographic side is sufficient enough to capture the most precious moments in your life. Author Bio: Jay Brent from ShoppingPreview – Digital Camera is a Criminal Justice Student in New York University. He snaps pictures from time to time using the Canon PowerShot A2300.